This page last revised September 17, 2015. 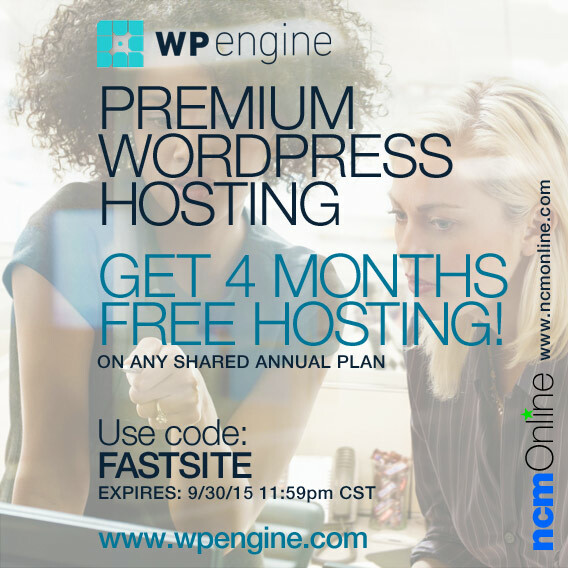 Get 4 months free on any WP Engine shared annual web hosting plan. Use coupon code FASTSITE in your cart when placing your order. Improve your conversion rates with a faster website hosted by WP Engine. Get stunning page-load speeds, top-notch security, and second-to-none customer support services. WordPress is not just WP Engine’s web hosting platform, it is their passion. Validity: Offer valid only for new hosting accounts only and does not apply to current hosting plan upgrades or current WP Engine customers. This limited-time promotion may not be combined with other offers. Valid only on annual billing cycle Personal, Professional, or Business shared WordPress web hosting plans.